The first six months of our daughter’s life were anything but typical. 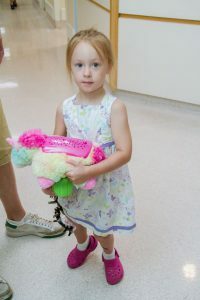 When she was two hours old, our doctor sat down in front of us with a pile of papers and a concerned look, telling us x-rays had shown Emily’s right femur to be significantly shorter than her left, most likely the result of a condition called Proximal Femoral Focal Deficiency. It was the first we had ever heard of this. Of all the things we worried about before the birth of our first child, this wasn’t even on the list. He never tried to sell us on how quick or easy this would be. He only told us what he knew he could accomplish. He would get our daughter’s legs to equal length. We were in. We are fortunate for so many reasons. With a solid hip and a strong femur, Emily’s condition is certainly more favorable than most. We found a doctor who is quite literally the best in the world at what he does. He has a team in place that is informed, experienced, friendly and helpful. None of that changes the fact that trips to West Palm Beach, some for as long as four months, can be difficult. When she is going through one of her three leg lengthenings, Emily must battle through daily physical therapy which any parent will tell you is stressful for everyone. But when our daughter is a teenager, standing confidently on “her own” two equal legs, I truly believe everyone in our family will be able to say that it was completely worth it.